Mark Ojakian, president of the Connecticut State Colleges and Universities. The Board of Regents for Higher Education will be asked Thursday to endorse a framework for saving at least $41 million annually through the administrative and operational consolidations of institutions that have remained autonomous since the merger in 2011 of the state’s 12 community colleges, four regional state universities and the online college, Charter Oak. Facing a shrinking college-age population and growing budget gaps, the system’s president, Mark Ojakian, released an outline Monday for an “operational consolidation” unifying the community colleges into a centrally managed institution that would retain its dozen campuses while shedding administrators at an annual saving of $28 million. An additional “administrative consolidation” across all 17 colleges and universities would streamline functions such as purchasing, information technology and human resources to save an additional annual savings of $13 million — efficiencies envisioned, but never realized when the schools were forged into the new Connecticut State Colleges and Universities system. Ojakian, who worked on the controversial merger as a top aide to Gov. Dannel P. Malloy in 2011 and then was named to lead the new system four years later after the tumultuous tenures of two presidents and two interim leaders, said financial pressures require him to go far beyond relatively simple back-office efficiencies. The $1.2 billion system is coping with a $35 million cut this year and the expectation of a $57 million cut the following year, Ojakian said. The outline released Monday is titled, “Students First,” and says the changes are intended to spare direct services to students. But it leaves many unanswered questions, most notably how would the community colleges, whose individual presidents often have crafted unique cultures and missions, be led? Ojakian, who plans to immediately embark on a listening tour to all campuses, said the goal would be to maintain the best individual characteristics, albeit while cutting the ranks of management by about 20 percent. The four regional state universities — Eastern, Western, Southern and Central Connecticut— will retain their identities and method of governance, while seeing their central offices shrink by about four percent as back office functions are centralized systemwide. The University of Connecticut stands apart from the Connecticut State Colleges and University system, financially independent and governed by its own Board of Trustees. 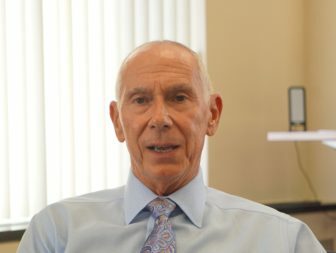 Ojakian released the broad framework of his plan Monday in preparation for an expected vote Thursday by the Board of Regents, with the goal of a developing a full implementation plan by the start of the fiscal year, July 1. The plan is to keep all 12 community college campuses, plus most, if not all, satellite campuses. Ojakian said he considered and rejected other more dramatic options, including closing a community college, converting the community colleges into satellite campuses of the four state universities, and consolidating the universities. “We had to look at every single option possible,” he said. If the Malloy administration’s concession talks with state employees fail, Ojakian said he would revisit all options. Ojakian said he closely examined what probably would have been seen as the most radical and politically difficult option: Making the community colleges branch campuses of the state universities, similar to UConn and its branches. Ultimately, it was rejected as blurring the missions of the universities and community colleges, plus it would require legislative approval — an uncertain prospect — and take longer to implement, he said. Ojakian was the deputy secretary of the Office of Policy and Management in 2011, leading concession talks in the first year of the Malloy administration. He became the governor’s chief of staff the following year, resigning in 2015. Unlike his predecessors in the higher-education system, Ojakian is seen as possessing better political skills, both internally and in dealing with the General Assembly. 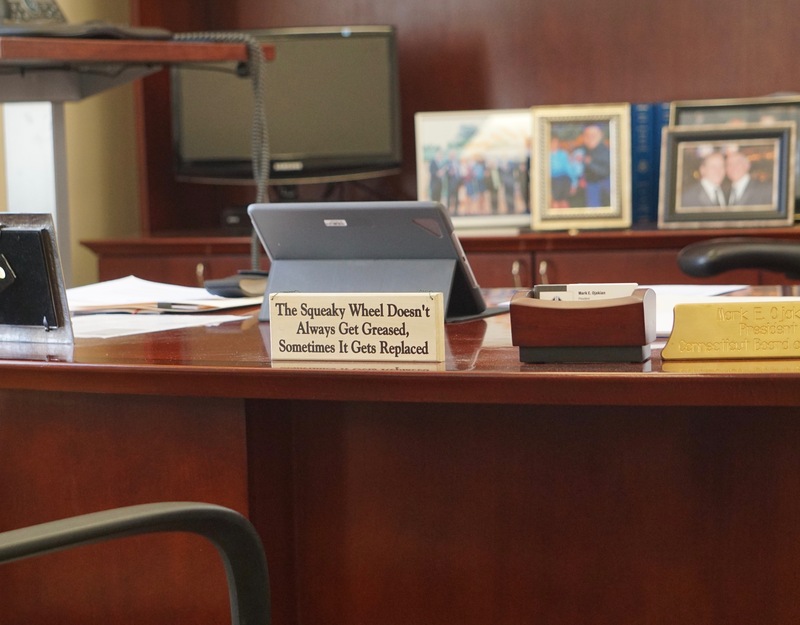 A gift from a former colleague, a sign on Ojakian\’s desk puckishly warns that complains go so far. 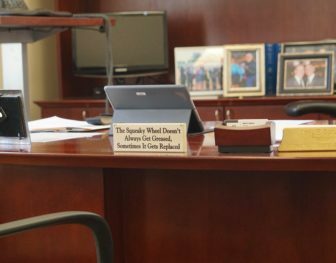 Ojakian privately briefed legislative leaders in recent days, though his plan is structured in a way that requires approval by the Board of Regents, not the General Assembly. House Minority Leader Themis Klarides, R-Derby, praised Ojakian, who worked closely with legislative leaders as the governor’s chief of staff, for crafting a long-range plan that preserves academics and student services. “He’s always been a man who in my experience gets the big picture,” she said. State support for the CSCU system has fallen by 12.5 percent since 2015 and it is likely to shrink further, Ojakian said. In the 2015-2016 fiscal year, the state provided $601 million in direct and indirect funding: $346 in appropriations to the system, plus $251 million to cover fringe benefits for its employees and about $4 million in workers compensation. That shrank by $35 million to $565.6 million in the current fiscal year. Ojakian said the system is faced with restructuring or continual cuts in an existing structure that now provides insufficient support to students because of a shortage of advisers, slow decisions on financial aid and curtailed hours at libraries. Ojakian said structural changes are preferable to the constant shrinking of the overall system. “We have to ask ourselves, are we really serving our students well if we continue to make cuts each year? Does it really make sense to continue ‘business as usual’ and risk the high quality learning our students expect and deserve?” he wrote. “Aren’t we doing a disservice to our state if we don’t preserve academic excellence and prepare our students for the competitive workforce that awaits them? How can we improve graduation and retention rates if we aren’t spending vital resources on student services?